This cute little bag is quick & easy to assemble, especially with the construction changes that Mary will teach you. There are 3 sizes to choose from. 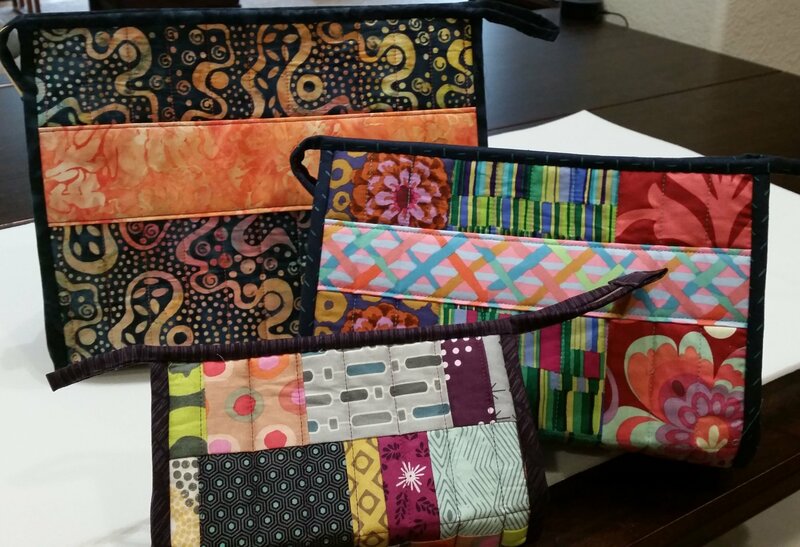 Use your favorite fabric or show off your piecing skills for the outside of the bag. This would be a great way to use up some of those orphan blocks. Mary has changed the pattern so that you can make the sides of the bag from a different fabric than the outside of the bag. Refer to the cutting instructions handout (next page) for the sizes of the pieces that you need. 1 zipper – please buy YKK zippers available at Lyons Quilting. You need a 22” zipper for the large or medium size and a 14” zipper for the small size. Sewing machine with all the usual supplies including a quarter inch foot. You will also need a zipper foot. If you have a walking foot, bring that too! I recommend a size 90 needle for assembling the bag. For thread, I recommend Aurifil for piecing – some of the stitching will show so pick a color that either doesn’t show at all or looks really pretty! Pre-class preparation: If you want to be able to finish the bag in class, you need to cut out all the pieces per the attached cutting instructions. You also need to sandwich & quilt the pieces for the outside of the bag and for the sides of the bag (a total of 2 quilted pieces). I’ve adjusted the instructions so that you can have sides that don’t match the body of the bag. (1) strip 2” x WOF and (1) sq 3” x 3” for the zipper tab. strap, (1) strip 2” x WOF and (1) sq 3” x 3” for the zipper tab.